Above: A rendering of the project, submitted to the city planning commission. The owners of Uptown's signature shopping center, Calhoun Square, are planning changes to the building that will reshape one of the city's busiest pedestrian corridors. The plans involve transforming the primary entrance on Lake and Hennepin from a cavernous empty space into a new retail location. The new entrance would move east on Lake Street, between Libertine and the former Figlio's space. Stuart Ackerberg, CEO of Ackerberg Group, which bought the mall last year, said the building's entrances are underutilized since most ground-floor retailers have gotten their own front doors during various renovations. "[That] works in many ways from a walkability and new urbanism perspective, but really created all sorts of challenges for the interior space, because you didn’t have to go through the center to get to a tenant," Ackerberg said. The changes will slightly reduce the footprint of the Figlio space, which will likely have a new tenant, Parella, this summer, according to Twin Cities Business. That reduction "creates a much more economical space, as the restaurant market in Uptown continues to become more and more competitive," Ackerberg's firm said in a letter to the city. Reconfiguring the current entrance will create a 957 square foot retail space -- Ackerberg said the tenant isn't yet known. The adjacent transit shelter will be downsized, but not eliminated. 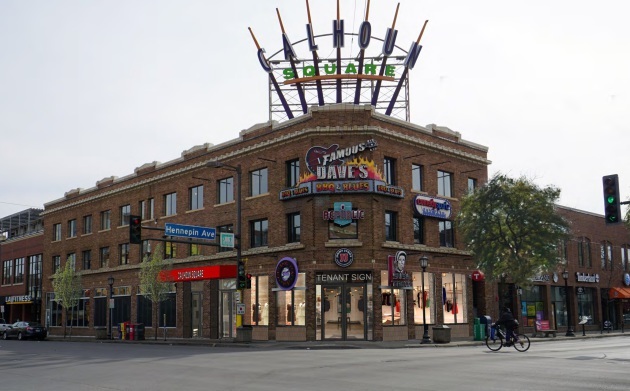 “When you have that glass and hopefully a fun retailer in there with more eyes on the street, I think it would actually make that intersection more vibrant than it is today," Ackerberg said. The changes will be discussed at the city planning commission next Monday.